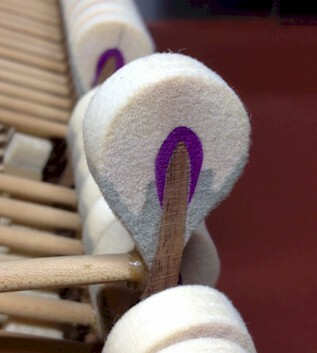 Properly matched hammers and action parts, even when the hammers are relatively heavy (as they are in many of the finest modern grands) can be balanced so that the action feels light and smooth, enabling excellent control down to the softest pianissimo, while allowing effortlessly executing big, repeated chords and difficult loud passagework. Some pianists and piano technicians recommend reproducing the light weight of hammers from pre-WW II pianos because their sound is cleaner and less aggressive, and their actions are very easy to play. That is certainly true. One only needs to play a few passages and glissandos on such a piano to realize how much easier it was to play demanding Romantic literature a hundred years ago.